I already published my research, what now? On Friday, October 21, in the XI Librarianship Meeting of Baja California, organized by ABIBAC, Asoc. de Bibliotecarios de Baja California, A.C., taking place in CETYS Universidad, campus Mexicali, I presented the workshop for librarians/researchers: ‘I already published my research, what now? Profiles management and Altmetrics to enhance visibility, attention and presume a little bit’. The objective of this workshop was to provide tools, strategies and procedures so that information professionals and libraries can support researchers in promoting their research published in scientific journals using international professional networks and channels for this purpose. The contents presented include the definition of professional networks and channels for the promotion of scientific publications, as well as a strategic workflow that every researcher should use in order to promote and gain value in terms of their visibility, attention and authority as scientists. Our presentation at #ECIL2016 in Prague: ‘Assessing spanish-speaking university students’ info-competencies with iSkills, SAILS, and an in-house instrument: Challenges and benefits’ was a success! Coauthors: Jesus Lau (presented at the conference), Juan D. Machin-Mastromatteo, Alberto Gárate, and A. Cecilia Tagliapietra-Ovies. #CETYS and its information culture are very fortunate, as it has been in the European Conference on Information Literacy for the fourth year in a row. I was invited by Sage Publishing and EBSCO to deliver the workshop ‘How to publish in a Social Sciences scientific journal’ in the #EntrePares Seminar 2016 in San Luis Potosí, Mexico. Many thanks to my hosts, the seminar organizers, and specially the public who were very interested and asked many interesting questions! It was my pleasure; and it is such an honor to have received this beutiful award from the Universidad Autónoma de San Luis Potosí and CONRICyT. This was one of my presentations for the 3rd. 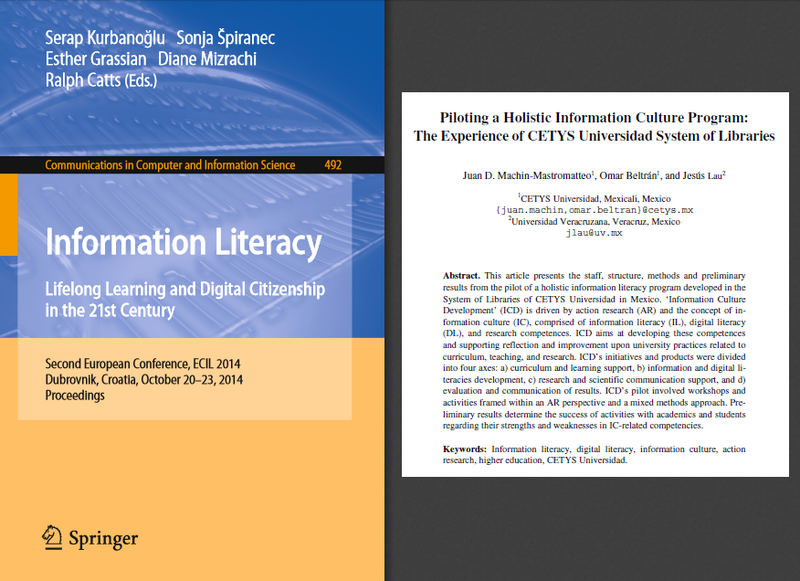 European Conference on Information Literacy (ECIL 2015), which took place during October 19-22 in Tallinn, Estonia. This first participation, presented on October 19, 2015 was about my work as a reference librarian in CETYS Universidad. This kind of participations allows us to promote our institutional milestones regarding the development of the Distinctive Element of CETYS Education labeled Information Culture. Also, it’s an interesting case study because we are covering information culture in a holistic manner, showing the activities conducted by both the academia and the libraries to foster its development, and highlighting collaborative experiences; this represents an area of immediate interest to those within this field of research and practice. The full text of this presentation (as well as that of the other one) was published in Springer’s Communications in Computer and Information Science (see below). Abstract: Information Culture Development (ICD) is a holistic information literacy program that was established in 2013 and developed at CETYS Universidad in Mexico. ICD caters to all university stakeholders with different initiatives that are contained within ICD’s four axes: (a) curriculum and learning support, (b) information and digital literacies development, (c) research and scientific communication support, and (d) evaluation and communication of results. This article presents such initiatives and the instruments used to evaluate them. Moreover, it analyses recent interviews with eight academic staff that have known of and benefited from these initiatives, both for themselves and for their students. The data analysis offers a means of determining ICD’s role in supporting the development of an information culture and positively influencing teaching, learning and research practices in the university. Furthermore, academic staff insights help guide the program’s further development, by pointing toward the need for future actions and strategies. Abstract: This article presents the staff, structure, methods and preliminary results from the pilot of a holistic information literacy program developed in the System of Libraries of CETYS Universidad in Mexico. ‘Information Culture Development’ (ICD) is driven by action research (AR) and the concept of information culture (IC), comprised of information literacy (IL), digital literacy (DL), and research competences. ICD aims at developing these competences and supporting reflection and improvement upon university practices related to curriculum, teaching, and research. ICD’s initiatives and products were divided into four axes: a) curriculum and learning support, b) information and digital literacies development, c) research and scientific communication support, and d) evaluation and communication of results. ICD’s pilot involved workshops and activities framed within an AR perspective and a mixed methods approach. Preliminary results determine the success of activities with academics and students regarding their strengths and weaknesses in IC-related competencies. 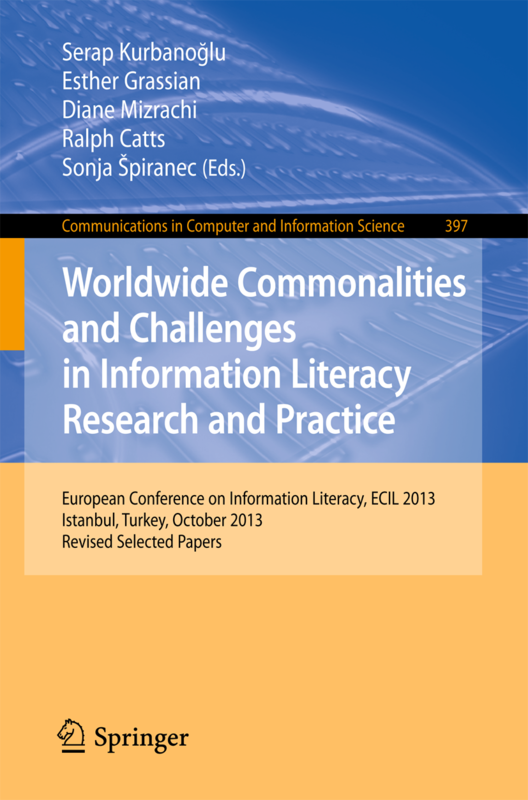 The first European Conference on Information Literacy (ECIL) took place on 22-25 October 2013, in Istambul, Turkey. I proposed two papers for this conference and I had the opportunity to get both accepted. This was an important milestone in my career to have two papers selected for the same conference, among the quite impressive sample from Iberoamerican works, Alejandro Uribe Tirado counted 23 contributions, in a conference with an European focus. Athough I could not attend the conference, both these papers were presented by my coauthors and they got published by Springer in the conference proceedings ‘Worldwide Commonalities and Challenges in Information Literacy Research and Practice’. In the following paragraphs you will find the information of both articles and some bullet points about them. Tracks and rebuilds a research agenda integrating information literacy with participative methodologies (E.g. action research). Develops and presents a questionnaire for worldwide experts that is being answered at this moment. You can still answer this questionnaire and share it with your colleagues! Sheila Webber wrote a nice post about this research on her blog, thanks! It’s part of my PhD research, it integrates social media in a learning experience, discovering the role of information literacy in such integration. The research and methodological framework ‘Doing Online Relearning through Information Skills’ is presented. It advances a conceptual, epistemological and methodological understanding that is important for online learning activities.